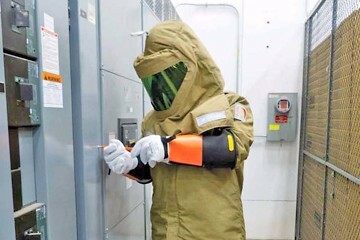 This 1-Day - Instructor-led, Certified Arc Flash and Shock Training course incorporates recent revisions to the latest Edition of CSA Z-462 Arc Flash Electrical Safety in the Workplace Standard. CSA Z-462 - Important Changes That You Should Know About. Electrical energy when harnessed and properly utilized can do significant amounts of work and can make our lives easier. The electrification of cities, industries and rural areas has had a life changing technological effect and caused society to advance. After electricity was brought to New York, it was nicknamed “The city that never sleeps”. While harnessing electricity can be highly productive, it also carries significant risks due to the amount of energy that can be released. An electric shock with as little as 50mA has the potential to be fatal. Utilizing electricity also carries arc-flash, blast and other safety risks. Maintaining electrical safety, arc-flash and shock protection is both the duty of employers and employees when working on electrical equipment. This is mandated in OHS legislation, due diligence clauses, electrical safety programs, the CSA Z462-18 standard and various other legislation. This course covers electrical safety and discusses topics relating to the following topics: safety requirements and duties, electrical safety programs, safety related maintenance requirements, safety requirements for special equipment, hazard mitigation, shock protection and arc-flash. One workplace electrical incident can cost an organization a huge price in terms of injuries, fines, reputation and workers compensation premiums. Employers and supervisors can face personal liability for an injury in their workplace that could result in fines up to $1,000,000, four years, or more, in jail, or both. Many workers may not have received arc flash hazard information in their apprenticeship training and many organizations do not meet current workplace electrical safety standards. This course identifies what it means to be a “qualified electrical worker” and organizations should be aware that holding a license as a journeyperson may not be enough to qualify. The importance of developing safe work procedures, training workers, identifying hazards, evaluating risks, planning and documenting safe work is covered. This course provides many benefits of an instructor lead course including: electrical safety examples, discussion, demonstrations and hands on training. This provides much more benefit than watching a video. There is no room for error when working with electrical equipment so why compromise on safety education? Note: Employers have the legislated obligation to identify hazards, evaluate the risks, select and implement the appropriate controls. This course helps companies to understand their legal requirements and what due diligence is required to avoid conviction under provincial or federal OHS legislation, or the Criminal Code of Canada. Students will learn real-life examples and have their electrical safety questions answered by a safety professional with years of electrical safety experience in the development and implementation of an arc flash safety program. Class discussion is encouraged and students also have an opportunity to learn from each other. They will understand the hazards of energized electrical work and how the following Top 5 mistakes workers make can lead to a very serious injury, lost production and/or a fatality. Top 5 mistakes workers make when it comes to electrical safety. Failure to verify the absence of voltage before beginning work. Failure to identify the arc flash hazard, evaluate the risk of arc flash and implement the appropriate controls. Inappropriate selection and/or use of personal protective equipment. Complacency to low voltage hazards (typically 115 to 250 volts). Failure to develop and communicate an emergency response plan. Our Arc Flash/Electrical Safety Masterclass course will students avoid these mistakes and help students to recover if they already made these kinds of mistakes. Learn from an instructor who is trained and knowledgeable regarding electrical safety. Students have the opportunity to ask questions which are answered in class while the thoughts are fresh. Students can enter discussion and get feedback from other attendees with examples of best practices. Real life examples and solutions are used to present the information in a meaningful way which helps students relate to their own workplace experiences. All levels of experience and knowledge are accommodated. Instructor-led classes have the flexibility to cater to all levels of experience and electrical knowledge. Even non-electrical workers will gain an appreciation for the hazards of electrical work. How will taking our Arc Flash Training course make you safer in your workplace? Our instructor-led Arc Flash training course presents students with information they need to evaluate the arc flash and shock hazards, and to help them to ensure the safety of themselves and other electrical workers that may be in proximity to energized electrical equipment. Students will understand the value of a comprehensive risk evaluation, the importance of safe work procedures and pre-job planning. Workers are given the information and workplace best practices in the course but many times are powerless to use the information because the infrastructure is not in place in their organization. Certification will not change that. This course covers the analytical process of identifying electrical hazards such as shock and arc flash burns, to determine and communicate the appropriate control methods to be used. We explain why complacency can be deadly when working with circuits energized at 120 volts. This one-day arc flash training course is designed to assist organizations to identify shock and arc flash hazards and prevent injuries and incidents associated with those hazards. Note: Students will demonstrate understanding of arc flash hazards and PPE protection by passing a proficiency examination at the end of the course. NOTE: This course DOES NOT INCLUDE A CSA Z462* Standard. Copies of the CSA Z462* Standard must be purchased separately from Canadian Standards Association and brought to the course. This course comes with an Arc Flash Training Certificate. The registration fee to attend this training course is $399 + GST/HST. Register 3 delegates at full price $399, and get a 4th registration FREE! This course earns 0.7 CEUs. We can present this Arc Flash & Shock Training - Certified Electrical Safety Instruction Course to your electrical engineering and maintenance staff, on your premises, tailored to your specific equipment and requirements. We are ready to help design this program for you. Click on the link below to request a FREE quotation.